If you do a lot of home cooking, you likely rely on your Kitchen-Aid range a lot. When something goes wrong with it, you have to find cooking alternatives, which can be a hassle considering your busy lifestyle in Southlake, North Richland Hills, or anywhere in the Dallas-Fort Worth area. 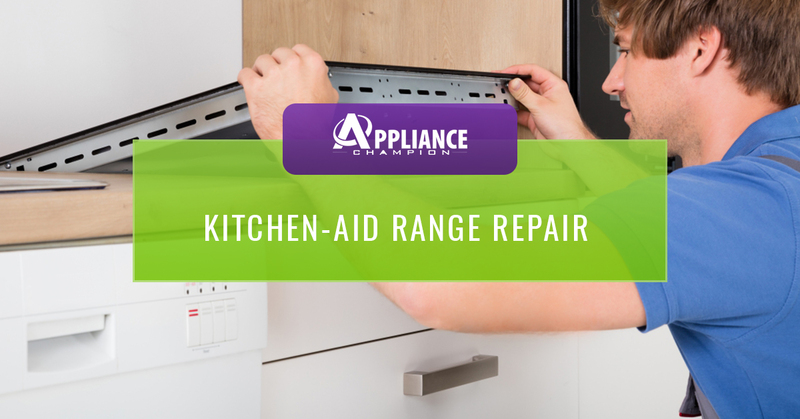 Instead of worrying about how you’re going to fix your range so you can prepare meals again, call on a Kitchen-Aid range repair professional of Appliance Champion instead! One thing you have to understand about ranges is they are complicated to fix unless you’re an expert in appliance repair and, more specifically, range or stove repair. You could waste all your valuable time trying to do it yourself, or you could call Appliance Champion, your local Kitchen-Aid range repair professional and get the job done in no time. It’s critical to let our licensed technicians work on your Kitchen-Aid range in order to save you time and money, and more importantly, prevent injury. If you notice anything not working quite right with your Kitchen-Aid range, don’t hesitate to give Appliance Champion a call. We’ll have it repaired in a flash! It’s critical to let our licensed technicians work on your Kitchen-Aid range in order to save you time and money, and more importantly, prevent injury. If you notice anything not working quite right with your Kitchen-Aid range, don’t hesitate to give Appliance Champion a call. We serve the Westlake, Southlake, and Keller area and we’ll have it repaired in a flash! Appliance Champion is a local, family-owned appliance repair company who provides stove repair by factory-certified repair techs for our customers in the Dallas-Fort Worth area. We hold ourselves, our staff and techs to a high standard of providing stove repair services that instill trust and peace of mind in our customers. The goal of Appliance Champion is for you to know that when your stove or other appliance goes out that there is someone who will take the situation that you find yourself in seriously and do our very best to provide a same-day service with factory-certified parts. We do our very best to set you up for success by providing advice for ongoing maintenance. Call Appliance Champion for top-rated stove repair and $25 off your service!